In the spring of 2018, Utah legislators passed a new law that regulates the sale of cannabidiol products in the state. Senate Bill 130, which became the Utah Cannabidiol Product Act, authorizes the sale and use of medicinal products produced from hemp. As a part of the new legislation, cannabidiol processors and laboratories in Utah have to undergo a process of licensing that ensures their legal compliance. Posting a medical marijuana bond is one of the requirements that has to be fulfilled. The effective date of the licensing criteria is July 1st, 2019. 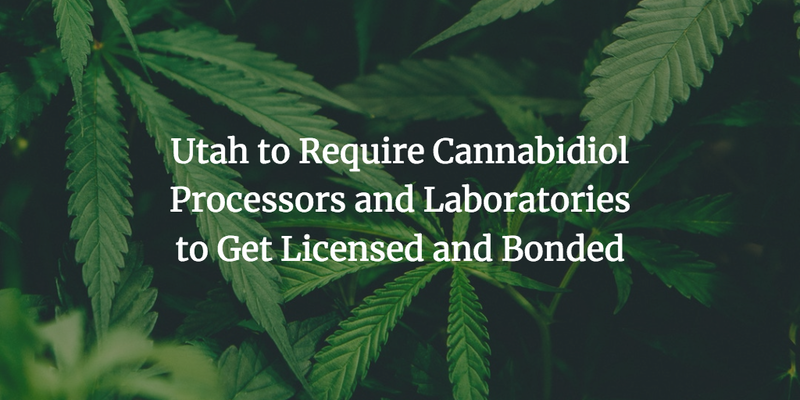 Here are the most important details to keep in mind if you want to obtain a license as a cannabidiol processor or laboratory in Utah under the new law. The new bill that was signed into law as the Cannabidiol Product Act authorizes the production of hemp and its sale and use under certain circumstances. The Utah Department of Agriculture and Food is the main state authority in charge of overseeing cannabidiol production and sale. The Act sets the conditions under which cannabidiol producers can operate in the state. All cannabidiol processors and laboratories will have to obtain a license from the Department. You will need a separate license for each of your locations. The renewal period is two years. A $100,000 surety bond has to be provided as a part of the process. It is conditioned on your compliance with all applicable state laws. The Department can make a claim against your bond without revoking your license in case you owe money to it. This is the procedure through which the authority can obtain a fair reimbursement for unpaid amounts on your side. In addition, the Act outlines the general operating requirements for cannabidiol producers. These include criteria about the product, labeling and packaging, testing, and reporting. The new law also defines the conditions for operations for cannabidiol-qualified pharmacies that can sell such products, as well as the tax rules. The Utah Department of Agriculture and Food will require all cannabidiol processors and laboratories that want to obtain a state license for operations to provide a $100,000 cash bond or surety bond, payable to the Department. The bond functions as an extra layer of guarantee that ensures licensees will follow the law, and more specifically, will comply with Chapter 43 in the Cannabidiol Product Act. Getting your medical marijuana bond entails covering a bond premium, which is a fraction of the required bond amount. It represents your surety bond cost, which is formulated on the basis of your personal and business finances. The most important factors that influence the price include your credit score, company financials, and any assets and liquidity that you can demonstrate. The stronger your financial profile is, the smaller your bond premium is likely to be. For applicants with good finances, the typical rates are between 1% and 5%. Thus, for a $100,000 bond, you can end up paying between $1,000 and $5,000. Need to learn more details about the bonding requirements for Utah cannabidiol processors and laboratories? Our bonding experts are here to help. Just reach us at 877.514.5146.